Columbus – Members of the Ohio Legislative Black Caucus (OLBC) are outraged by proposed changes to Ohio’s election law in House Bill 3 sponsored by Representative Kevin DeWine (R-Fairborn) that would require all voters to present a current and valid government issued photo ID or another form of acceptable identification such as a utility bill to cast a vote. “Allegations of widespread voter fraud as justification for this change are simply untrue,” said Representative Barbara Sykes (D-Akron) and OLBC President. “However, there is documented evidence and statistics that prove that this type of requirement is likely to disenfranchise and overburden voters, especially racial minorities and the poor. In October 2005, a U.S. appeals court upheld an injunction barring the state of Georgia from enforcing a law requiring citizens to present a government-issued photo ID in order to vote. The law was declared unconstitutional and called a smokescreen by opponents who accused Republicans of trying to dilute the minority vote. Opponents provided evidence and statistics that documented disparities in the number of government ID’s issued to white and minority voters. They also demonstrated the negative impact of eliminating the sworn affidavit of identify option as a viable alternative to presenting identification. “Even in 2005 we are still fighting the same Jim-Crow Era tactics that try to rob citizens of equal access and opportunity in this country,” said Representative Sykes. Jim Crow was the name given to the system of laws and customs that enforced racial segregation and discrimination throughout the United States, especially in the South, from the late 19th century through the 1960's. OLBC members and other opponents believe that current safeguards in Ohio law have worked exceptionally well to prevent voter fraud. A post-election review of Ohio in 2004 found only 4 illegal votes out of 9-million cast. “I have no doubt that that this change will suppress minority votes across Ohio. Surely, House Bill 3 counteracts the intent of the Voting Rights Act and the entire Civil Rights movement,” said Representative Sykes. 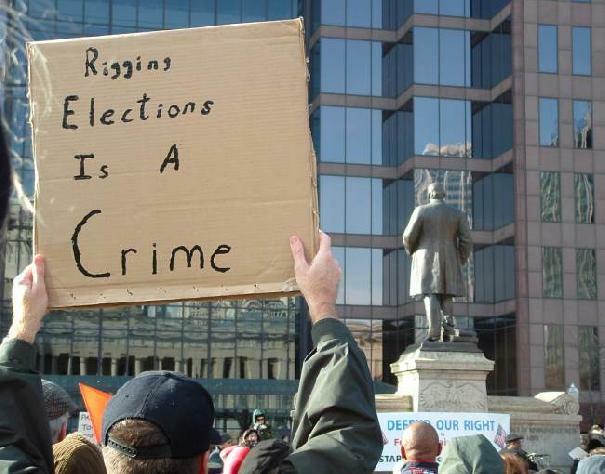 Ohio's GOP-controlled legislature is poised to pass---probably today (Tuesday, January 31) ---a repressive new law that will gut free elections here and is already surfacing around the US. The bill is designed to help end free elections and continue the process of installing the GOP as America's permanent ruling party. Called HB3, the bill demands discriminatory voter ID, severely cripples the possibility of statewide recounts and actually ends the process of state-based challenges to federal elections---most importantly for president---held within the state. In other words, the type of legal challenge mounted to the theft of Ohio's electoral votes in the 2004 election will now be all but impossible in the future. Section 35-05.18 of HB3 requires restrictive identification requirements for anyone trying to vote in an Ohio election. Photo ID, a utility bill, a bank statement, a government check or other government document showing the name and current address of the voter will be required. This requirement is perfectly designed to slow down the voting process in inner city precincts. It's meant to allow Republican "challengers" to intimidate anyone who turns up to vote in heavily Democratic precincts. It will also virtually eliminate the homeless, elderly and impoverished from the voting rolls. Election protection advocates estimate this requirement will erase 100,000 to 200,000 voters in a typical statewide election. By way of reference, George W. Bush allegedly carried Ohio---and the presidency---by less than 119,000 votes in 2004. The ID requirement is the direct result of intervention by two high-powered Republican attorneys with ties to the White House and Senate Majority Leader Bill Frist (R-Tenn.). Congressman Bob Ney allowed the Bush-Cheney re-election national counsel Mark "Thor" Hearne to testify last March as a so-called "voting rights advocate." Hearne, whose resume shows no connection to voting rights organizations, was responsible for advising the Bush-Cheney campaign on national litigation and election law strategy during the 2004 election. CASE Ohio Urges "No" Vote, on HB 3, Dubbing Ohio's HAVA the "Make It Harder for Americans to Vote Act"
Some call it “reform,” CASE calls it regression. Restrictive ID requirements (Sec. 3505.18) Could cost 100,000 to 200,000 votes lost! Deletion of the recount as machine audit (Sec. 3506.20) Ignoring the possibility of failure or error! Unaffordable recount cost (Sec. 3515.03) 11,366 precincts X $50 = $568,000! Prohibition of election contests (Sec. 3515.08) Denying voters a remedy in Ohio law. Don’t just believe the “talking points”; read for yourself. government document that shows the name and current address of the elector. For what possible reason would we not want to verify results with an audit? Do the math: 11,366 precincts X $50 = $568,000! applicable provisions of federal law. Some will counter that challenges are still available under federal law. soon, it does nothing about an election already decided. CASE does not support HB 3. This bill should be voted down. A statistical study just released by the National Election Data Archive has concluded that six (6) percent of Ohio's polled precincts show irtually impossible vote counts, and over 40% show improbable vote counts, and that, the patterns of Ohio's discrepancies are consistent with outcome-altering vote miscounts.